To the untrained eye, it’s just a lot of birds on an otherwise deserted stretch of muddy, flat coastline. But for ornithologists, North Korea’s west coast is a little piece of paradise each spring — and both the birds and a dedicated group of birdwatchers travel a long way to get there. While North Korea is wary of letting foreigners inside its borders, a recent trip by a New Zealand research team to the mudflats near Nampo, southwest of the capital, Pyongyang, underscores some tentative but significant progress by outside scientists to conduct small-scale research projects — as long as they don’t rub up against sensitive topics and are seen as useful to North Korea itself. Last year, for example, an international team of scientists was allowed to set up seismographs and other equipment to monitor ominous activity on Mount Paektu, a huge volcano that straddles North Korea’s border with China. In typical North Korean style, the New Zealand ornithologists were told not to take photos of the birds in some places. Their mobile phone and computer access was also partly restricted. But the researchers say that overall, the trip went smoothly. The trip in May was part of a four-year study by the Pukorokoro Miranda Shorebird Centre in New Zealand, which is where many of the birds end the summer portion of their journey. In three days of on-site bird-watching, the team counted approximately 20,000 migratory birds from as far off as Australia and South Asia. Team members hope the project will shed light on the birds’ migrations and generate international efforts to conserve their habitats. North Korean officials share that hope, which dovetails with the authoritarian nation’s efforts to promote itself as an eco-friendly, unspoiled land of natural attractions that will interest the one kind of foreigner it is trying hard to woo — the wealthy tourist. The birds being watched aren’t exactly household names — bar-tailed godwits (Limosa Iapponica), great knots (Calidris Tenuirostris) and dunlins (Calidris Alpina). But in scientific circles, the godwits are something of a sensation. To survive the journey northward, the birds need to spend a month to six weeks in a place where they can rest and replenish their strength, sometimes doubling their weight, from a lean 330 grams to a plump 660 grams or more, before starting on the final leg. A godwit dubbed “E7” made international headlines in 2007 when, thanks to a tiny transmitter implanted in her abdomen, she was confirmed to have flown for seven days and nights without stopping to a feeding ground in China — a 10,200-kilometer flight. That was the longest nonstop flight by a land bird ever recorded. When she flew back to New Zealand from Alaska, entirely over the open Pacific, without stopping for eight days and nights, she set another record distance, of 11,760 kilometers. Rapid development on the coasts of China and South Korea may be leaving the birds with fewer places to take their mid-trip rest. That leaves the relatively untouched west coast of North Korea as one of the few places they can still find their favorite foods, small bits of seafood — mostly mollusks and crustaceans — and worms. 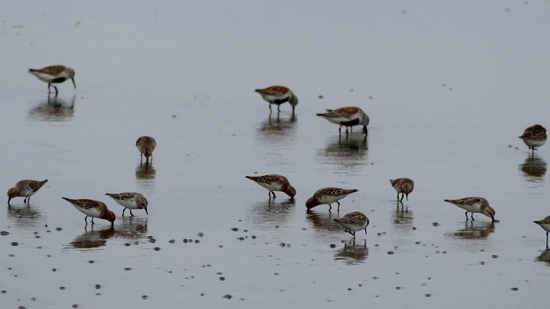 Woodley said godwits are listed as threatened and red knots are considered to be an endangered species. The agreement for the New Zealand team to go bird watching in North Korea goes back to 2007. It was followed by a one-off bird-watching trip two years later. The four-year study project was approved last year, and that opened the way for the trip two months ago. The team plans to return next April.